England goalkeeper Jack Butland says he feels angered when fellow professional players fake injury on the pitch. "It has always wound me up," he said. "It is one of my pet hates. I want to go and pick people up." Butland, 22, was expected to miss up to six weeks after fracturing a finger in training for Stoke two weeks ago. But he had the finger strapped up and went on to play for the Potters in their 1-1 draw against Norwich and 1-0 defeat by West Brom. Butland added: "It is a shame you cannot slap people round the face any more - you get sent off. "I played rugby until I was 14 and it just not something you did. If you were really hurt, you stayed down. "I have got a special glove that protects the finger, and it is not on my mind at all. It is something I am able to ignore and get on with playing." Butland says he is looking to put England's number one goalkeeper Joe Hart under pressure, adding that he is not in the squad to "make up the numbers". The 22-year-old made his debut against Italy in August 2012 and makes his return to the senior set-up for the forthcoming double-header. 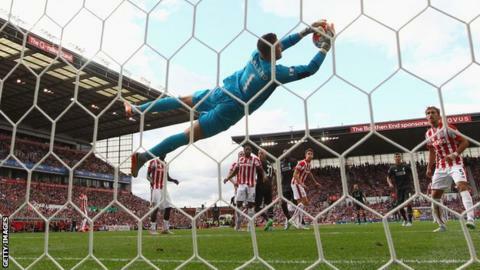 "Joe's an incredible keeper who's established himself for a long time now," said Butland. "He's reached his 50 caps, which is brilliant, but for me I want to put pressure on him and hopefully get some game time."